A few weeks ago it was announced that Bahaa Taher had won the very first Arabic Language Booker Prize. I was extremely happy for him as he is not only one of my favorite Arab authors but he is also one authors full stop. After Naguib Mahfouz, Bahaa Taher is one of the highest profile writers of literature in Arabic. And since Naguib Mafouz is no longer with us on this earth, that pretty well leaves a generation of younger Arab writers striving for the same high profile that Bahaa Taher enjoys today. 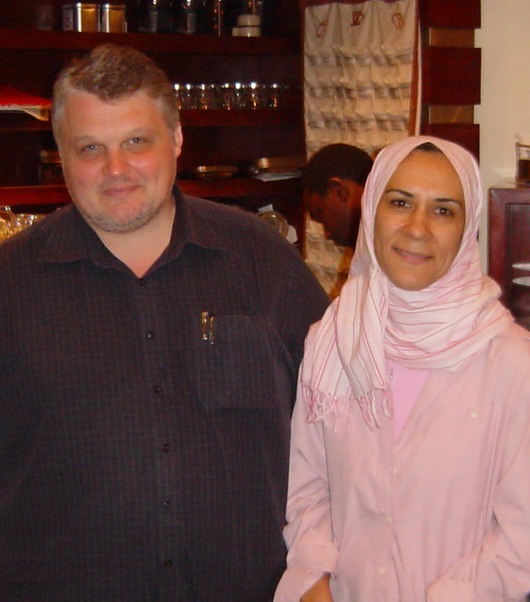 In May of 2007 I was in Cairo on some business and doing some personal research on a project of mine. I wanted to meet Bahaa Taher as I had been an admirer from a distance. So I contacted a person I knew who works as a journalist at Egypt Today and did the six degrees of separation thing I am generally so good at. I was on some business in Alexandria when I called on this contact. Three or four days went by and I heard nothing back. I had already returned to Cairo where I was staying in the Maadi district at a friend’s house (Thomas Barmettler). We had just sat down to lunch when I received a phone call from a lady who worked at the well known Diwan Book Store on the 26th of July Street in Zamalek, an island in central Cairo. She told me that as I was an author Bahaa Taher would be interested to meet me as well. If I can remember correctly the lady’s name was Marwa. Thomas volunteered to take me down to Zamalek which saved me from having to get a taxi cab. I appreciated that. Thomas also had two other guests from China, Ying Xiao (who goes as “Shine”) and her friend Cathie, who is a real estate investor. Ying Xiao is a freelance journalist. Bahaa Taher freely gave his time and was very open with us. I honestly think he was a bit upset at some of Ying Xiao’s questioning, which was along the line of asking his opinions regarding her strong feeling that Egypt had lost somehow its “egyptianess” through the years and had simply adopted the cultures of the waves of invadors whereas China had been a shining example of maintaining their basic character – being Chinese. Anyone who has read Bahaa Taher or has read anything about Bahaa Taher knows well that he is and has always been a Pan-Arabist. I could at times see him squirming in his seat at Ying Xiao’s line of questioning. I tried to keep my conversation with him quite simple. I asked about his work. But Ying Xiao kept coming back to this string of questions that she had about Egypt today not being the Egypt that it started out to be – that the Egyptians of today were not recognizable as the ancient Egyptians. Ying Xiao even went as far to point out that the culture was not continuous to which Bahaa Taher answered that Egyptian culture is much like an onion: You can peel layer by layer and each one over the next is different, but each are still part of the onion. This reminded me oddly of the layers of pudding that James Michner used as a descriptive of South African culture in The Covenant, which I had read so many years ago. Nonetheless, it was a rather enjoyable afternoon. I left that day with a copy of Bahaa’s Love in Exile and read it in Dubai on my way back to Bangkok. I was quite honestly rather haunted by Bahaa’s voice when I read the book. I kept hearing him speak when I read the voice of the protagonist. I would suppose this was a good thing. Anyway, the book’s main character shared so many of the same politics that Bahaa Taher had spoken about that afternoon I couldn’t help but see the book as somehow authobiographical. Especially since Bahaa had also been in exile in Switzerland under similar circumstances. 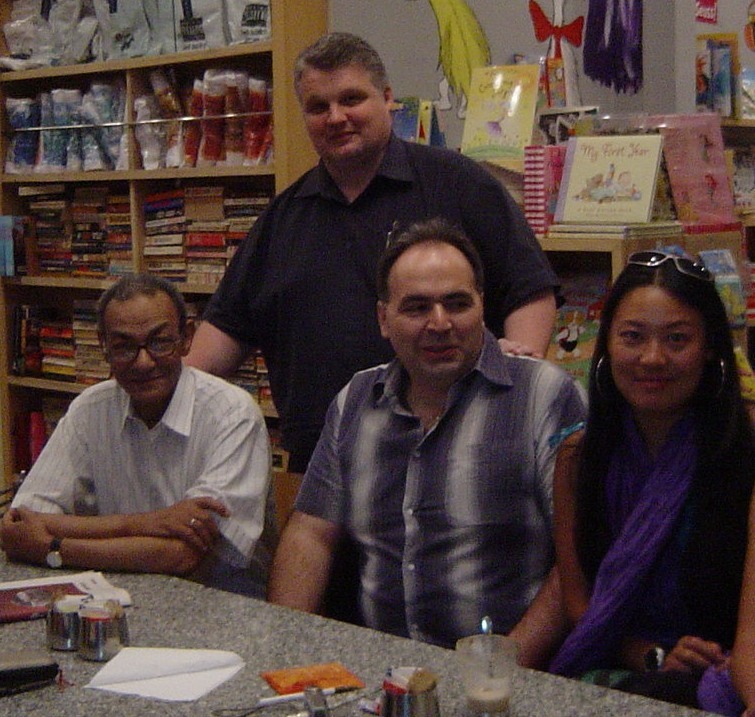 Bahaa Taher was also interested in what I had written in my refutation of the Vatican Islam Conspiracy. He asked me several questions about my book but kept it mainly to questions, not making too much comment in reply. He thought the title was provacative enough that I might not get reasonable discussions from people on all sides of the issue – but he wished me luck with it and also encouraged me to keep it up. I appreciated that coming from a man of his stature and reputation. Some time later Bahaa Taher stopped back at the bookstore to autographa an Arabic language copy of his latest novel Aunt Safiyya and the Monastery. Thomas sent this to me by post. I keep it proudly as a souvenir of that day last May in Zamalek! I have written Bahaa Taher a time or two. He doesn’t stay year round in Cairo (he splits the time with his home in Switzerland – with his Greek Swiss wife). But I do hope he is in Cairo the next time I go there. I want to congratulate him on the Booker Prize face-to-face. I read the article with great interest. I was searching to contact all these years, but failed to do so, as not reply for my postal letter. If anybody knows Bahaa Taher’s email id or tel number kindly help me by giving it.